Completato, completado, 完了, terminé, completed! At last the star is completed! It’s definitely not perfect and I can’t send it to my swap partner so I’ll have to come up with another idea. Anyway here are some pics of the front and back. Thanks for your ideas and encouragement along the way. If you’re looking for the give-away, it’s here. Oh, Munaiba, you are too hard on yourself. That block is BEAUTIFUL! I would love to receive it if I was your swap partner. Why can’t you give it to your swap partner. I think it’s beautiful. I’d love to have it. Don’t be so hard on yourself. You did a great job. I agree. 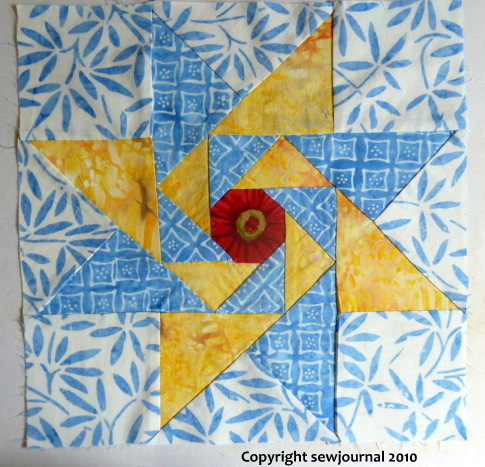 It’s a lovely block and I’m sure your partner would love to receive it. 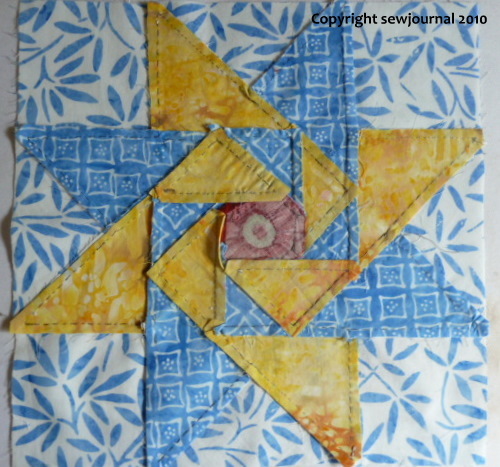 After such persistance with this block I think you’ve done a wonderful job, even if it has a pleat. You’ve inspired me to have a go myself. The little pleat–it looks like it’s a little fold that could maybe have a seam added by hand to just make that the seam line instead of a fold? Does that make sense at all? Ok Caroline. Your wish is my command. lol However you might want to see the next post as I made an alternative.